Out in the middle of the Nevada desert is a small RV park where the Sun City RV club had me come to do the History Undressed show for them. I dressed up my daughter and the teenager I brought along to help with Sara and did a mini fashion show before I started my show. 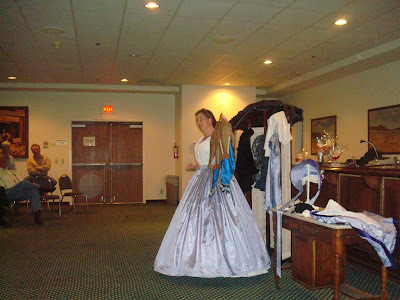 In the History Undressed show, I start out fully dressed as a moderately wealthy Lady from the Victorian Era and proceed to show all the accouterments, layers, and items that make up a genteel Lady's wardrobe. I explain all the pieces of clothing, including the 9 articles of undergarments. 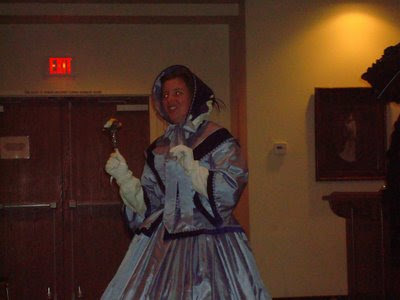 The show runs about 45 minutes to 1 hour and is enjoyed by both genders almost all ages (it is a bit boring for children under age 10 as is evidenced by the fact that my three year old had to be taken out of the room twice by the teenager playing her nanny). 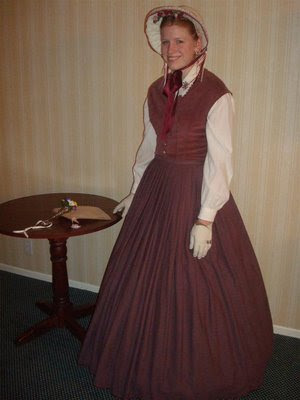 Deena in a 1850's or 60's outfit which would have been very fitting for a young lady her age from the middle class who was out visiting or shopping. 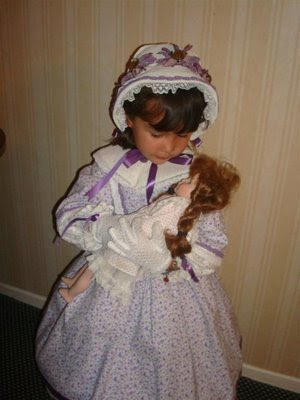 Sara in a 1860's outfit with her dolly. 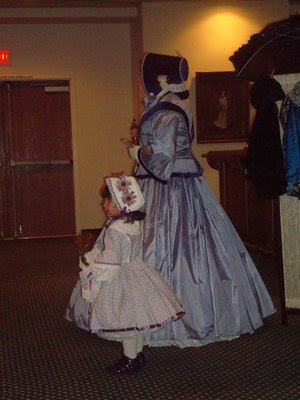 This outfit would have been worn by a little girl from a middle- to upper-class family. 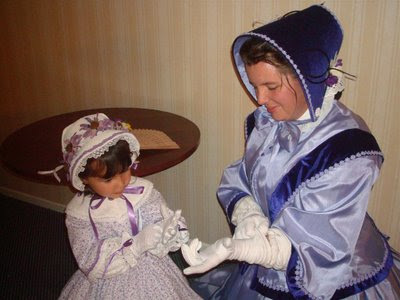 It amazes me that even little boys wore dresses such as this until they were age 3 or 4 - more masculine colors, or course! 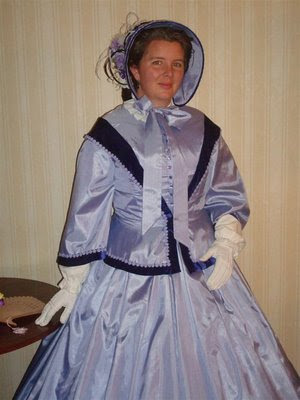 Me in my new 1860's dress. 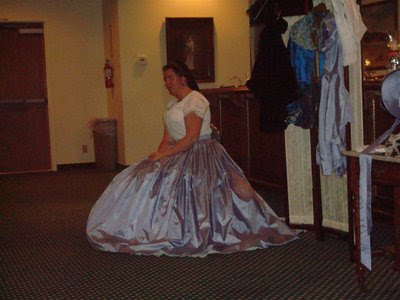 This taffeta and velvet day dress would have been worn by a fairly wealthy lady and would have been suitable for visiting or shopping or receiving guests for afternoon tea. Mother and daughter making last preparations before the show. The photos below are a little dark since the lighting was not very good. Down to my nine pieces of undergarments! 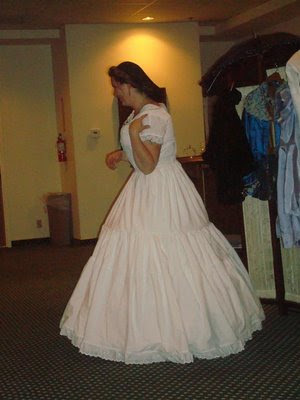 And yes, a true lady would wear all this every day, all day long. And that's not even the outer garments! Don't worry, no more items come off at this point. I take off 4 pieces of underwear and yet I still have on just as much, if not more clothing than most of the people in the audience!